Follow our step-by-step, photo illustrated recipe for making this Southern Pot Roast. This is a basic recipe for one of our Southern Classics that makes a one pot meal to feed the entire family. Just a few simple ingredients are all you’ll need, and we’ll help you cook it until it’s perfectly juicy and tender. Printable recipe included. Pardon me if I have to stop and take a nap before I complete this recipe for Taste of Southern. I might be about “stuffed” following the completion of the cooking for this Pot Roast. I had to wait about 4 hours for this to cook, and the anticipation continued to build while waiting. Once it was completed, and the photo’s all taken, it was supper time. I just had to have a big serving. Growing up Gordon, in my younger years while still at home, Sunday dinners were the most anticipated day of the week for me. I’ve always loved to eat, and Sunday dinner almost always turned out to be the biggest and best meal of the week. Mama was at her best cooking Sunday dinners. I’ve mentioned it before, so forgive me for repeating myself, but we always had about 10-15 people at our house on Sundays. All the family was there, and most of the time, Mama would invite the pastor and his family home with us as well. It turned out alright for me, as I ended up marrying one of those pastors daughters later in life. Still, we did have this one other pastor that ate with us many times while he was in charge of the local church. We got a new pastor every year or two it seems. They were appointed to serve our area. He lived up in Greensboro, NC which was well over an hours drive from where our church was. It wasn’t unusual for our local pastors to not live in our town. The churches were always small, and most of the pastors couldn’t afford to give up their jobs to move here and pastor the church full time. So, Mama would always invite them over for Sunday dinner. They would eat with us, then go out “visiting” for a couple of hours in the afternoon, before returning to the church for the Sunday evening service. It must have been tough on them and their families, but hopefully, a little break at our house for dinner helped them along the way. This one pastor I’m mentioning, had two young sons and one older daughter as I recall. The two boys were younger than I was, with the youngest probably about 5 or 6 years old at the time. He was small for his age it seemed, but we played together after dinner, and after most of the church services before they headed back home. What I remember most was that this young boy… never ate ANYTHING for Sunday dinner but BISCUITS. I never understood it. Mama would have the large oval table loaded with all kinds of vegetables, at least one meat, if not two, and he didn’t want anything but her homemade BISCUITS. It struck Mama as kind of strange the first time or two they came around. She worried that he didn’t like anything she had fixed, but his mother said he was just a little funny about what he ate. A bit dismayed by it all, I’d watch as his mother would take a couple of biscuits from the serving plate and break them up onto his plate. Then, he’d use his fork and pick them up and eat them, one piece by one piece. I wondered how he could possibly pass up all the fried chicken, meatloaf, and other dishes Mama had prepared. Yet, he seemed happy with what he had, so we all just learned to accept it. Of course, Pot Roast was one of the dishes Mama would sometimes prepare for Sunday dinner. Even though it’s usually cooked with some vegetables, like the carrots, potatoes and onions used here, I always thought it was best when paired up with a big scoop of Mama’s mashed potatoes, then smothered in gravy. Digging into that big old pot roast today, I was quickly transported back to that large oval table, surrounded by family and friends, and enjoying each and every bite. The conversations, laughter and stuffed bellies afterwards were all a very memorable part of my early childhood. Below, you’ll find a fairly basic recipe for making our Southern Pot Roast. 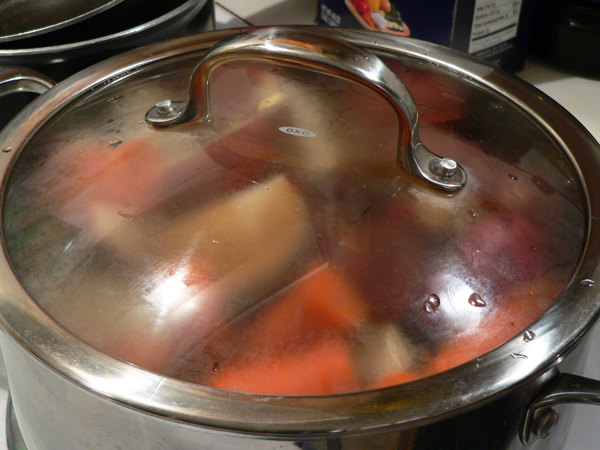 I’m using water instead of Beef Broth, but you can certainly use the broth if you have it. It will make the taste much richer for certain. But, as mentioned, I’m just sharing the basics, and you can develop your own versions from there. This is really a great “one pot” meal, and sure to be a hit with the family if you’ll give it plenty of time to cook. 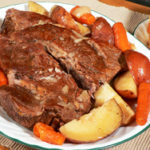 Pot Roast needs to cook for a good long time to become tender, so make sure you have plenty of time to let it slowly roast in the oven prior to serving. Ready to give it a try? Alright then, let’s get in the kitchen and start working on some Sunday dinner memories of your own. In other words… Let’s Get Cooking! 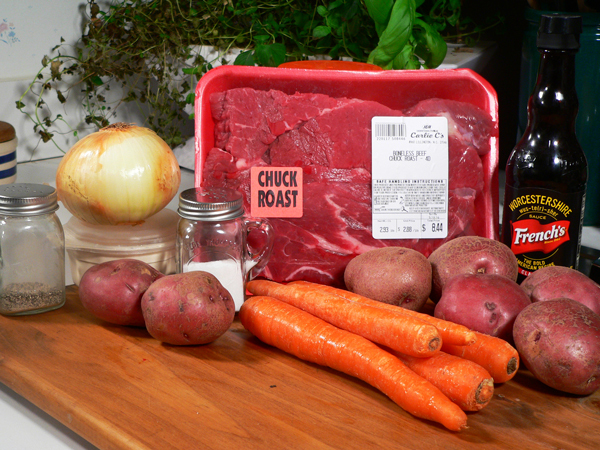 Our Classic Southern Pot Roast: You’ll need these ingredients. 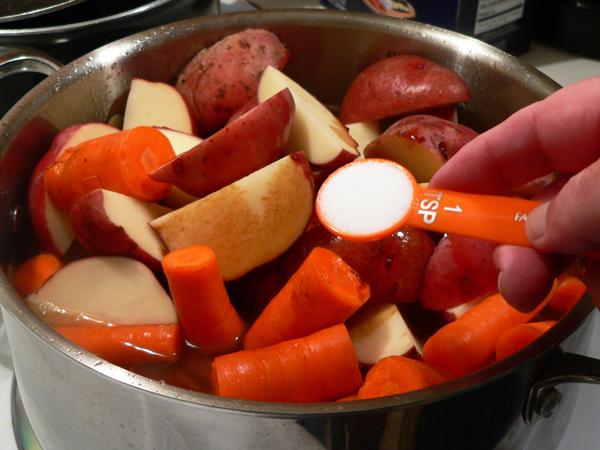 Wash the potatoes and the carrots under cool running water. Let drain. You’ll need a large roasting pan or sauce pot, depending on the size of your roast. Place this on your stove top over Medium heat and let it warm up a bit. Add the Bacon Grease. Bacon Grease is simply the fat leftover from cooking your bacon. It’s great for seasoning all kinds of Southern dishes, so be sure to save it each time you fry up some bacon. Keep it in a closed container in your refrigerator for use as needed. When the bacon grease has melted, place the roast in the sauce pot. We’re going to sear it on both sides before roasting it in the oven. Let it sear on each side for about 3 minutes. Searing will help seal in some of the juices. Sear on one side, then using some tongs, flip it over and sear on the other side. As we mentioned, this will take only about 2-3 minutes on each side. Once it’s been seared on both sides, remove the roast and place on a plate until we get everything else ready. Depending on the size, you will need to either halve or quarter your potatoes. 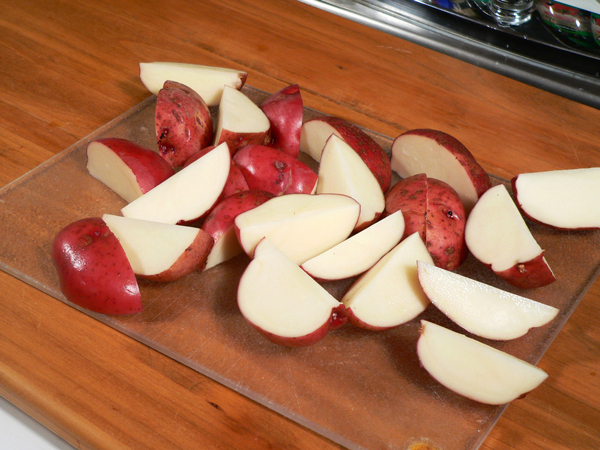 If you’re using small potatoes, you could also just leave them whole. It’s up to you. I prefer to leave the peeling on, but you could peel them if you desire. Again, it’s your choice. Same goes for the carrots. 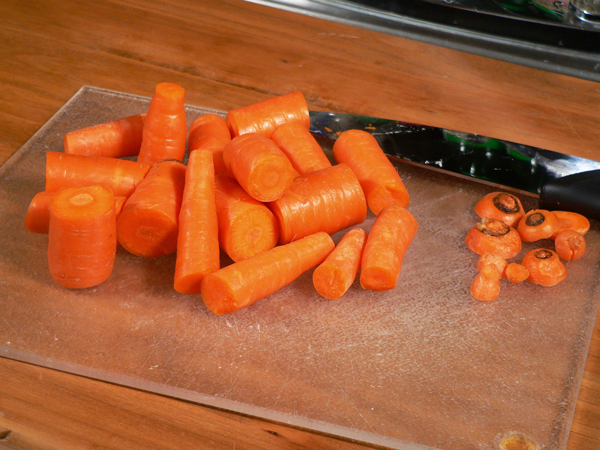 Depending on the size, you’ll probably want to cut your carrots into smaller pieces. Baby carrots can go in whole of course. Be sure to trim off and discard the ends if you’re using larger carrots. 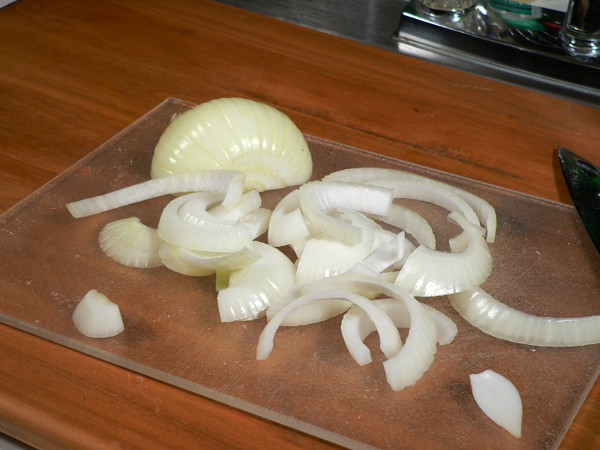 Peel the outer brown skin from your onion, then slice it in half. Slice the halves into large pieces. Layer the onions in the bottom of your roasting pot. We’ll place the roast on top of the onions to keep it raised a bit off the bottom. That’s why we suggest you leave the onion slices a bit larger size. Place the roast on top of the sliced onions. Please note that we do not have heat turned on underneath the pot while we’re doing this. 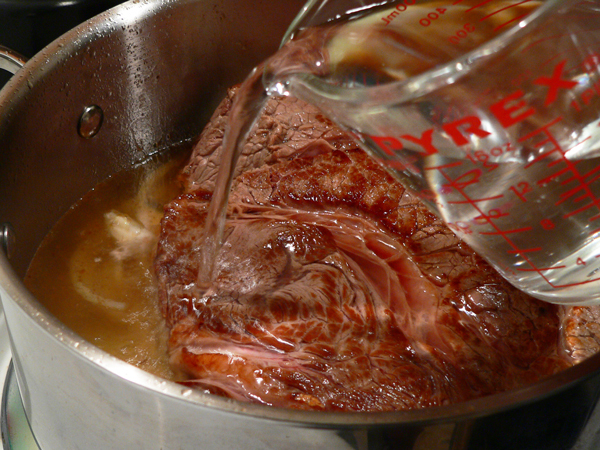 Add just enough water to the pot to bring the water level to about 3/4th of the way up the side of the roast. We’re making just a basic pot roast with this recipe. You could also add Beef Broth if you’d prefer, or even some tomato sauce. There are lots of variations on making a pot roast. Start out with our basic recipe, then experiment on your own to develop something you might like even better. Place the potatoes and carrots on top of the roast. Drizzle the Worcestershire over the top of the vegetables. Sprinkle the Black Pepper over the vegetables as well. Place the cover on top of the pot. 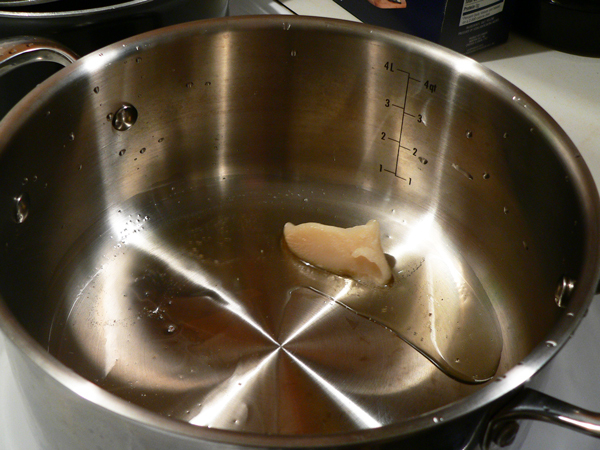 You could also cover the pot with a sheet of aluminum foil if you don’t have a good fitting lid for your pot. Place the roast in a oven that has been preheated to 275F degrees. The roast will need plenty of time to cook to make it nice and tender. You should figure about an hour per pound, possibly more. 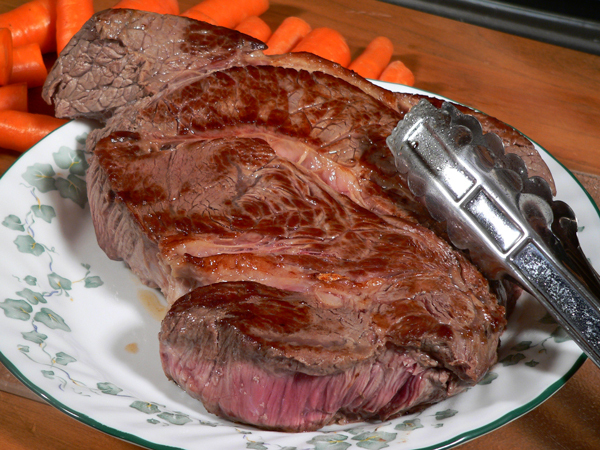 Medium-Rare: The internal temperature of the roast should be about 145F degrees after letting the roast stand for 15-20 minutes. Medium-Done: The internal temperature of the roast should be about 165F degrees after letting the roast stand for 15-20 minutes. Either way, cook the meat until it’s about 5-10 degrees BELOW the desired temp. It will continue to cook and will rise another 5-10 degrees after it’s removed from the oven. Confused yet? 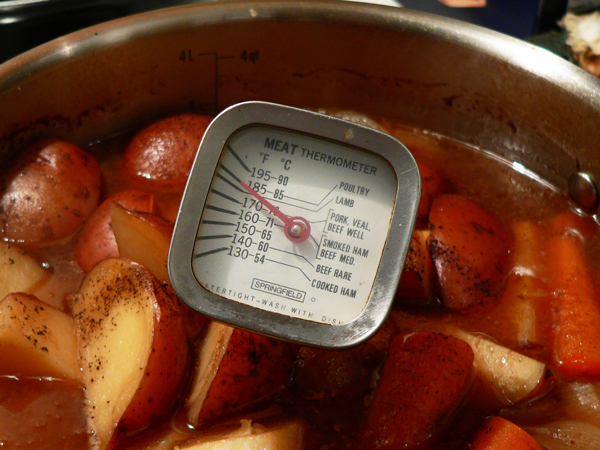 This Meat Thermometer says that Beef cooked to a Medium temp needs to reach about 160F degrees. I tested this BEFORE I removed the roast from the oven. The STANDING temps mentioned above would be determined once the roast was removed from the oven and been allowed to rest for 15 to 20 minutes to determine the desired degree of cooking. I like my steaks rare, but I’d prefer the pot roast be cooked to a medium-done range. The main thing is that the roast is cooked until it’s TENDER. This is what takes the longer cooking time. Yes, it’s done after it reaches about 165F degrees, but just like pork, it needs to cook to a higher temp in order to break down the tough connective tissues in the meat. 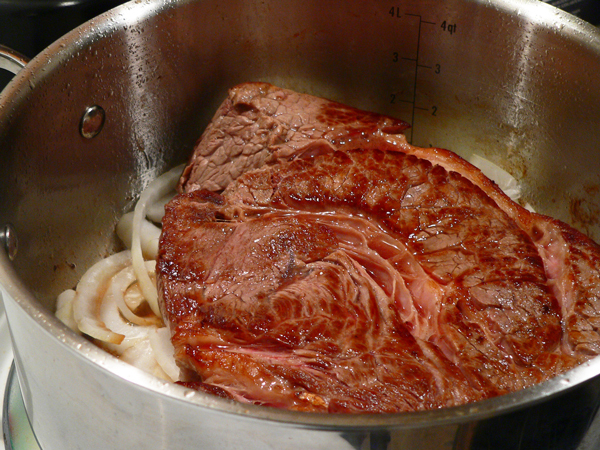 Tender cooked pot roast will pretty much just fall apart when you try to remove it from the pot. That’s much better than it being so tough you can’t hardly chew it. Go ahead and cook it until it’s good and tender and you’ll enjoy it much better. 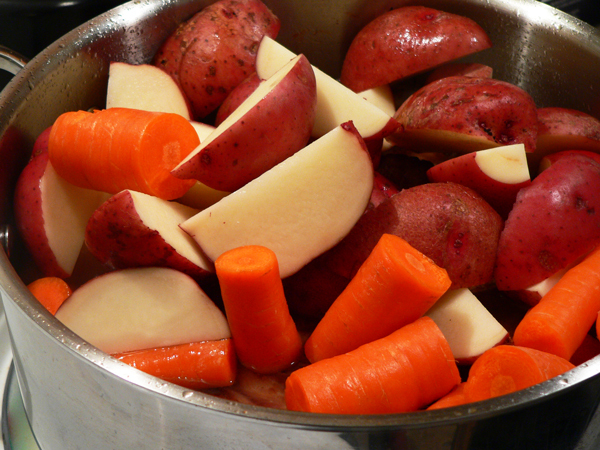 Remove the roast to a large platter, and place the cooked vegetables around the sides to serve it. 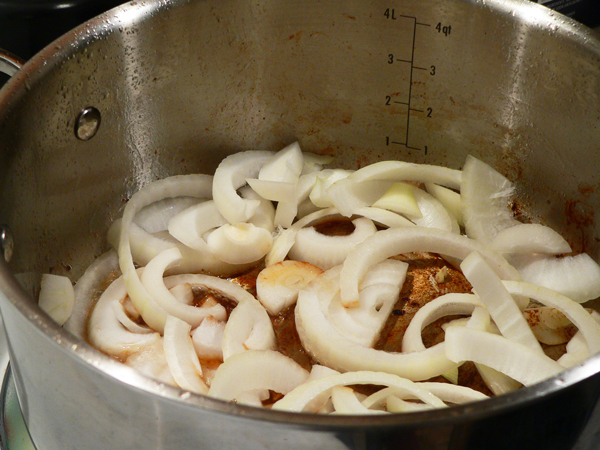 Gravy: If desired, you can make gravy from the remaining cooking liquid in your pot. You’ll need about two cups of liquid to do this. Mix a Tablespoon of corn starch into a couple of Tablespoons of COLD water. Stir this until it’s creamy and mixed well. Heat the liquid stock just until its at the boiling point, then slowly stir in the cornstarch slurry. Continue to stir this and bring it up to a boil until it thickens. Serve this gravy over your roast, or over your roast with some mashed potatoes. Good stuff. PS: Leftovers make a pretty good sandwich when placed between a couple of slices of white bread. Just saying. 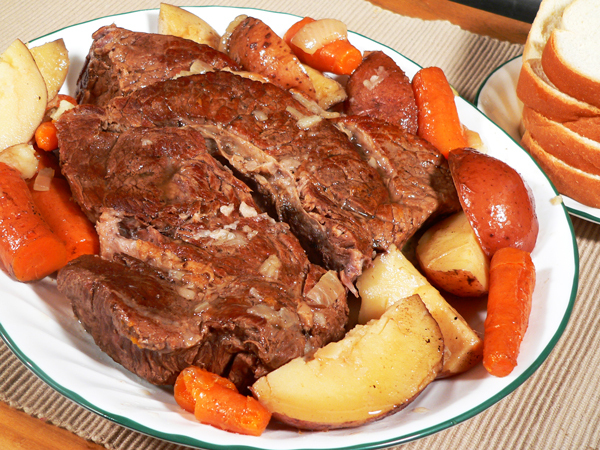 Follow our step-by-step, photo illustrated recipe for making this Southern Pot Roast. This is a basic recipe for one of our Southern Classics that makes a one pot meal to feed the entire family. Just a few simple ingredients are all you’ll need, and we’ll help you cook it until it’s perfectly juicy and tender. 4 cups warm Water, approx. Set chuck roast on counter top, bring to room temperature, about 1 hour. 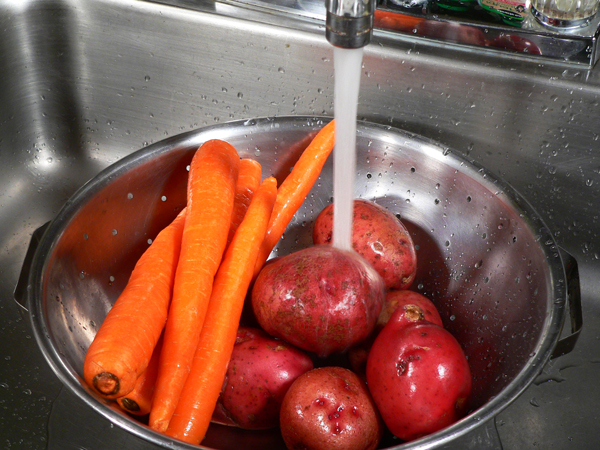 Wash potatoes and carrots under cold running water. Let drain. Place large oven proof pot, or Dutch Oven, on stovetop over Medium heat. When hot, add the Bacon Grease. 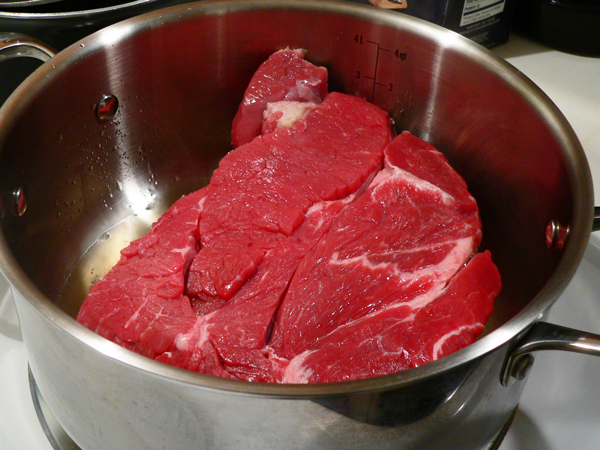 Place chuck roast in pot. Let sear for about 2 minutes on Medium heat. Flip the roast over, searing other side for 2 minutes. Remove roast from pot. Set on plate. Peel potatoes if desired. Cut in halves or quarters. Set aside. Peel carrots if desired. Cut into sections about 2 inches long. Set aside. Remove outer skin from onion. Cut in half. Cut each half into slices. Set aside. Layer the onion slices in the bottom of the pot. Place the roast back in pot, on top of the onions. 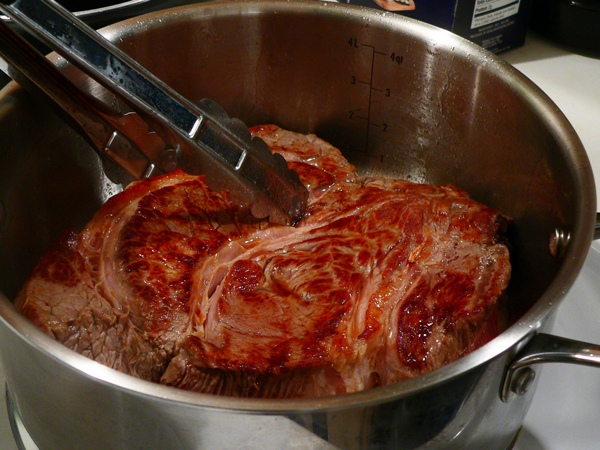 Add enough WARM water, to cover 3/4ths up the side of the roast. Place in oven at 275F degrees. Bake for 3 ½ – 4 hours, or until roast is tender. Remove roast to serving platter. Place veggies around side. 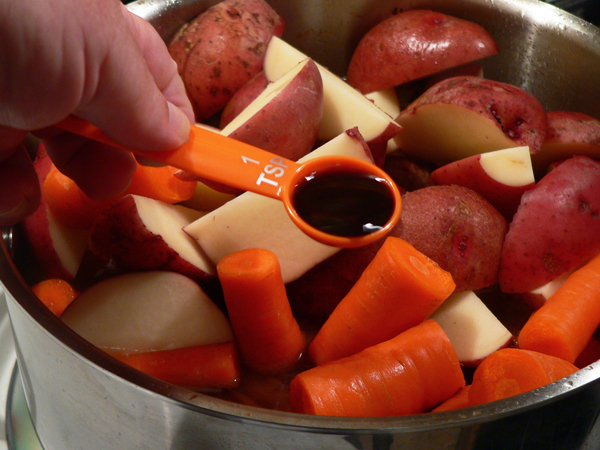 Use any leftover liquid from the roasting pan to make a delicious homemade gravy. Your Comments: Planning to try our Pot Roast recipe? I’d love to hear your comments about it. It will only take a minute or two for you to share your thoughts with us in the Comments section below. Please note that all of our Comments are moderated. That just means that I personally read each and every one of them before they are approved for our family friendly site here on the Internet. Your comment will not appear immediately, but I’ll do my best to get it posted online as soon as possible. I do appreciate you taking the time to share your comments with us, and I’ll look forward to hearing from you. Thank you in advance. Sign Up For Our FREE Newsletter: While you’re here, be sure to Sign Up for our totally FREE Newsletter. Each week, I try to send out an Email to let you know about the newest recipe that I’ve posted here on Taste of Southern. It’s a great way to keep up to date on the latest happenings around here, and we’ll let you know first about our upcoming contests and giveaways. It’s absolutely FREE to signup, and you can do that by entering the requested information in the box below, or in the one you’ll see in the top right hand corner of each page of our site. And, should you ever decide you’re just no longer interested, it’s even easier to unsubscribe. I hope you’ll never feel that way though. So, go ahead and Sign Up while you are here. I’ll be looking for you on our list. Thank You again for your support and for your visit today. Please feel free to share information about our site with your family and friends. I greatly appreciate it. As a teen, my mom taught me to use coffee as the liquid in which to cook the roast. I also add a can of Cream of Mushroom soup, an envelope of Lipton’s Onion Soup mix and an envelope of brown gravy. 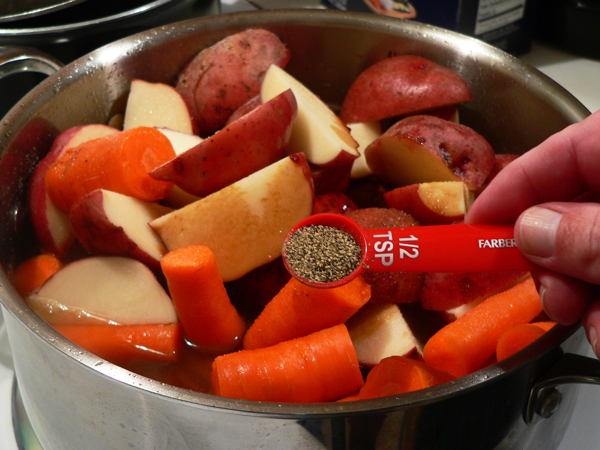 There is always a wonderful gravy ready to drizzle over the roast and potatoes. I never thought about searing in bacon grease so I’m anxious to try this recipe. Hi Steve good slow cooked pot roast,nothing finer.I always enjoy your news letters.This one about preachers and small churches brought back fond memories to me,i call it the good old days,times were much simpler.I miss those days.Thanks for sharing. My dad was a minister for over 45 years and and with my mother raised 6 children. Times were tough, but on Sunday mom would get up early and put a roast on not only to feed us, but the college students who attended church and helped with Sunday School and Vacation Bible School. Special ocassions she would also make pies the Saturday before. She would also add potatoes and carrots usually corn and salad. These students were from all over the United States and only went home during holidays. We didn’t use paper plates, so the students would do dishes and clean up. Several of these students went on to become ministers and missionaries, but I’m sure they remember the meals they shared at our home. Mom taught us to include others and I believe we can serve others and make a difference in their lifes and ours. May God continue to bless you. Great recipe Steve! I’m looking forward to trying this out with a pot roast when I catch it on sale then progress on to wild game and impress whoever wishes to try it. Thanks again for your newsletters and recipes! !